This video was the very last video that would feature the late Pastor Bethuel Dongo, the founder of Buyamba. He shares the needs of Uganda and what Buyamba is doing to meet those needs and to help the orphaned and needy children. Buyamba, a non-profit 501(c)3 corporation, was founded in the U.S. in 1999, to support the Dongos’ efforts with Buyamba Orphan Outreach in Uganda. Buyamba supported them through a child sponsorship program and provision of needed resources. As a result, God Cares Nursery and Primary School opened in 2002 with 97 children, in the basement of the church where The Dongo family continues to serve. Currently, Buyamba financially supports the education and care of over 1800 children through our sponsorship programs. After seeing such a great need within their beloved country, God put it on Pastor Bethuel and Florence Dongos’ hearts to reach out to His people, people with Aids (HIV), orphans, and children who are abandoned, destitute and poverty stricken. Recognizing thousands of children lacked love, education, and simple basic needs, Bethuel and Florence started Buyamba Orphan Outreach to provide love, care and assistance to orphans and need﻿y children whose parents were too sick or destitute to ca﻿re for them. The story goes back further than that. Since the late Pastor Bethuel Dongo and his wife Florence were in ministry from a young age, they made a decision to open their hearts to whatever God would have them do to help Uganda, and they knew caring for orphans would be part of that plan. Although they were very poor and had the challenges of growing a church and raising their own biological kids, they were determined to tend to the needs of the fatherless. The “collection” of children actually started with the Dongo children who had been given the heart of God early in their attempts to help orphaned and abandoned children. Florence recounts that it was not unusual for one of her own kids to arrive home with a little friend who had no parents and needed help. The little food they had for themselves would now be shared with another. Whether it was Worship, Ezra, Glory or Thanks, the orphaned child would have been promised a home and a mom and dad who would take care of them. Each situation was dire, and by the end, 22 orphans would be calling them mom and dad for they had certainly found a home in the Dongo household. These were children left behind and in desperate situations that are now married or self-sustaining in various careers and some with children of their own. Pastor Dongo held tightly to his vision to build a five story building that would be a home to orphans while serving as a school. The first five story building was completed in 2005 by generous donors. The rooms of the school quickly filled up and it has been bursting at the seams ever since. Then the land was purchased for the high school (about an hour away) and the construction began on another five-story building, completed in 2011, that now houses God Cares High School and educates over 800 children. With the help of a few strategic churches and many individual donors, the school was dedicated to the Lord in 2016. As of 2011 there are two campuses. God Cares Nursery/﻿﻿﻿Primary ﻿﻿﻿and God Cares High School. Both provide a solid Christian education and is home to over 350 orphans or boarders from needy families.﻿﻿﻿ As of 2015 Buyamba owns land in Jinja for a third God Cares School which has not yet been constructed. 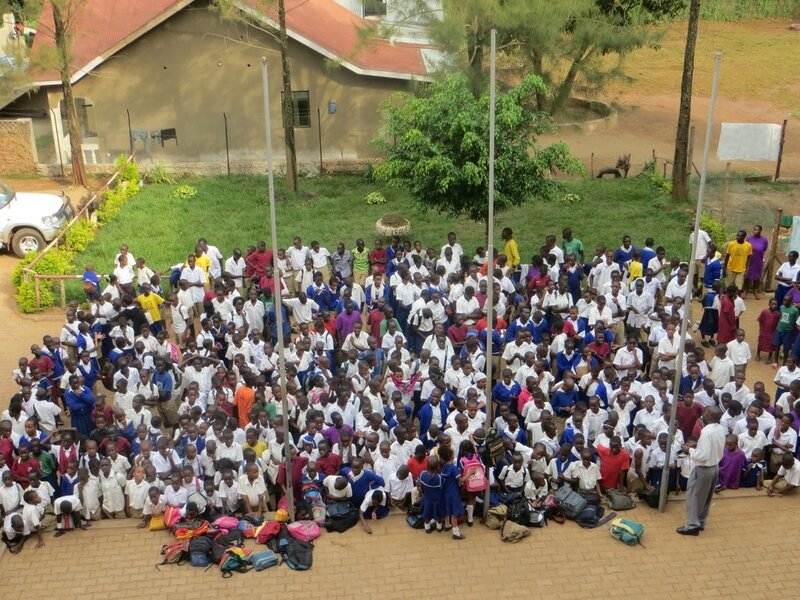 Today, through the faithfulness and generosity of our sponsors and benefactors throughout the U.S, and the tireless efforts of our team of volunteers, Buyamba currently sponsors the care and education of 1800 orphans and needy children in Uganda. We are now dreaming of the day when God provides for the full construction and completion of a third God Cares school building to meet the needs of children in Jinja and for the Buyamba Children’s Village; a community of homes that would place our orphans in a family setting. We have been blessed to see the Lord grow this ministry and fulfill the initial vision He set in the hearts of late Pastor Bethuel and Florence Dongo. We, at Buyamba continue to dream and look to the future as to how we can further the work to which we have been called as we impact the lives of Uganda’s children. In conjunction with our vision, we long to see the children of Uganda rise to meet the needs of their generation, ﻿empowered by the tools of ﻿﻿﻿education ﻿﻿﻿and rooted in faith﻿; they will impact Uganda.